A very interesting feature of this package is that you are able to benefit from our Mobile-app which is a big boost for any business. More and more people are using smart phones,therefore being listed on our mobile app can give you a competitive edge over your competitors. Moreover you can add fields such as your mission and vision statement, the various brands you deal with, methods of payments, cover pictures, Social Media Links, Job vacancies and coupons. Your customers will be able to see the name, address, telephone/fax, company intro, Yellow Mail, business category, opening hours, logo, website address, google location and customer review of your business in the mobile app. 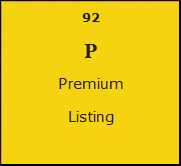 With the Premium, you can list your business under 1 Main category, 3 subcategories with unlimited keywords and 3 sub sub categories with 10 keywords.